Writing for Your Passion or Market? Writing for your Passion or for your Market? What is the biggest challenge that authors face today? The team from K-lytics.com, a research service for the e-book market, just conducted more than a hundred in-depth interviews with authors from all kinds of backgrounds. Their very first answer was almost unanimous: Visibility! How do you get your book found among millions of competing titles? How do you get your book in front of potential readers? How do you stand out from the crowd once you do? How do you get noticed at all? How do you develop a brand as an author? How do you keep your book up there on the best seller list, once you had a lucky shot? How do you prevent the book from dropping back into oblivion? Authors may use different words, but in essence, they all describe the same issue: how to use marketing, promotion and sales to gain visibility, both for one’s books and as an author. Most authors write because they want to write. It is that simple. Writing is their passion, not business administration, economics, or the laws of supply and demand. But it is exactly the latter to which authors fall victim to these days. As much as the Indy publishing and the e-book trend have lowered the barriers to entry for authors (and want-to-be authors), they have increased the level of competition in the book market. Simply put, the Indy book market is getting crowded, very crowded. Have you ever attended a big open-air concert? No, not in the seated area, but down there in the arena, in the middle of the crowd. AC/DC, Madonna, U2, Lady Gaga, Coldplay, you name it. The place is cramped. It feels tight. You wave and cheer at your idol on the stage but go unnoticed. You are a tiny particle in a sea of bodies. You get shoved around. You feel the elbows and sweaty bodies of the people around you. This is what it must feel like to be a book in the Amazon Kindle Store. Let us take the Amazon Kindle platform as an example. Amazon controls more than 60 percent of the U.S. e-book market and is clearly a leading indicator of the market situation. At the time I write these lines, the total number of e-books available on Amazon.com is 3,159,243. The number of English-language e-books exceeds 2.6 million. And this represents just a snapshot in time. Every month, more than 70,000 titles are added to the platform, translating into approximately 25 percent annual growth in the Kindle e-book supply. The implications of this are clear: the indy author’s biggest challenge for the time to come is visibility, precisely as reflected in the author interviews quoted above. How do you stand out from the crowd? How do you get noticed at all? No, Kindle readers are not going to browse through hundreds of thousands of titles to make up their mind what to read next. Most users will click on the book that is shown to them or highlighted. When you browse the front page of the Amazon Kindle store, approximately one hundred book titles will be shown to you (provided you care to scroll down). Mathematically, the chance of your book showing up on that front page is 0.003 percent; that is one in more than thirty thousand books. Let us see how this situation unfolds when looking at the 28 main book genres featured on Amazon Kindle. As you can see from Exhibit 1, the situation is quite diverse across the genres. The degree of competition in non-fiction is about 70 percent higher than in literature and fiction. No big surprise. But who would have thought that religion and spirituality was the largest main category on Kindle with almost 300,000 English titles? On the other end of the spectrum, you find genres such as travel, or comics and graphic novels. There, the number of English titles is around 40,000, or maybe less. Now, this is still a lot, and to make sense of this in practice, one must do two things. First, you must relate the number of titles (competition) to the level of sales in the respective book genre. 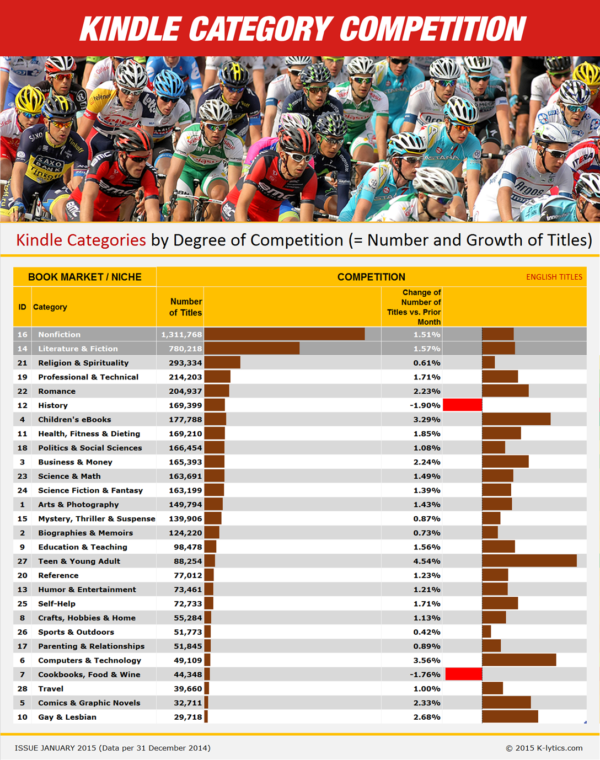 The objective is to identify those markets that show the highest book sales, but contain the fewest books in the category. To understand this concept, let us look at the 28 main book genres once more. 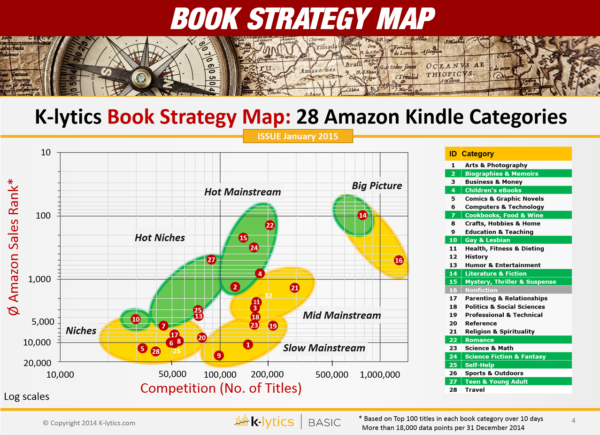 You can already see that the level of sales (demand) and the competition as measured by the number of available titles (supply) differ significantly from one book genre to the next. Second, you have to “niche it down”. In other words, you have to take the approach to the next level of detail. One level down, you will find more than 345 book sub-categories (and corresponding Top 100 Best Seller lists on Amazon). And many of them break down into third-level sub-sub-categories (of which there are more than 2,000) and even fourth-level book genres (i.e. sub-sub-sub-categories). The Science Fiction and Fantasy category has shown a continuous positive trend in the second half of 2014. It currently represents the third highest-selling genre on Kindle, behind Romance and Mystery, Thrillers, and Suspense (measured by the sales ranks of the Top 100 Best Sellers in each category). Now, Science Fiction and Fantasy in the Kindle Store contains about 35 sub- and sub-sub-categories. Their range of sales performance and degree of competition is extremely broad. You can find niches such as Science Fiction and Fantasy Classics, where the average sales volume for a Top 20 title is around 30 to 35 books per day. At the same time, the level of competition is at and below 400 titles. On the other end of the spectrum, you will find sub-sub-categories such as Science Fiction Anthologies and Short Stories. Here, a Top 20 title averages around eight copies per day but competes with more than 6,800 other titles on Kindle. Do you get the idea? The performance of each of the 30 Science Fiction and Fantasy sub-genres is fundamentally different; some are hot, while others are total non-sellers. Why waste your writing talent, creativity, and resources on the wrong ones? The same applies to all other main books genres. Remember the analogy of standing out from the crowd at the big rock concert? It is hardly possible. As an author or publisher, you can spend a vast amount of marketing dollars. If your target market is too broad, this spend will be like a drop in the ocean and provide zero returns. Instead, you should narrow down and know your target market and readers. It is like attending a concert in a small jazz club; if you cheer and clap, the performer will notice. Likewise, if you focus your marketing efforts on a small, but high-performing book market niche, the odds that the readers will notice (and pay) you are much higher. Hence, know your market. Book publishing and marketing only works if you know what market you target, what commercial potential it represents, and what level of competition you face. Writing for your passion is one thing. Doing so while taking a professional commercial approach is a different ballgame. Remember, as an indy author you are more than just a writer. You are an entrepreneur, one who has to perform the many functions that, in a publishing company, are covered by whole departments of specialists. Marketing is one of them. Get ahead of the game and become a great marketer yourself. That starts with proper market intelligence. Alex Newton is the CEO and founder of K-lytic.com, e-book market intelligence for success. About K-lytics.com E-book publishing has become like drilling for oil. Highly profitable for those who know where to dig and hit a well; incredibly frustrating for those whose exploration efforts take place in the wrong fields or who lack the proper technology. This is where K-lytics comes into play. K-lytics provides market data on hundreds of book market niches, enabling authors and publishers to take better and faster publishing decisions. This entry was posted in 81 and tagged Alex Newton, K-lytic.com on February 20, 2015 by aipman1.